Sign up to help build trail in northwest Ohio between the communities of Florida and Grand Rapids in Henry and Wood Counties. Rick Adamson's renowned work crew will build new off-road trail on the historic Miami & Erie Canal towpath route. Accommodations are camping at Mary Jane Thurston State Park (no electric hookups). Some food is being provided by the St. Patrick's Catholic Church, but for most meals volunteers must provide their own. The event runs between Saturday, June 18 and Wednesday, June 22. Work times are generally from 8 am to 3 pm leaving plenty of time for recreation. The North Country Trail currently breaks off from the Buckeye Trail in this section and heads north through Liberty Center. 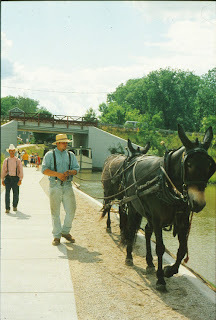 Come see why the trail should continue to Grand Rapids before turning north! At Providence Metropark you can experience the canal days with a ride on a recreated canal boat, and a visit to the operating Ludwig Mill. Contact Rick Adamson for more details.